A dollar is a dollar is a dollar, right? Not quite. Not all revenue dollars are created equal, but all gross profit dollars are. Gross profit, not revenue, is the metric companies should be using to compare themselves. Ultimately, gross profits account for more than 55% of the forward multiple of publicly traded SaaS companies after normalizing for revenue growth. SaaS companies vary hugely in their gross margins. BenefitFocus, Five9 and Shopify operate at 45-55% gross margins. 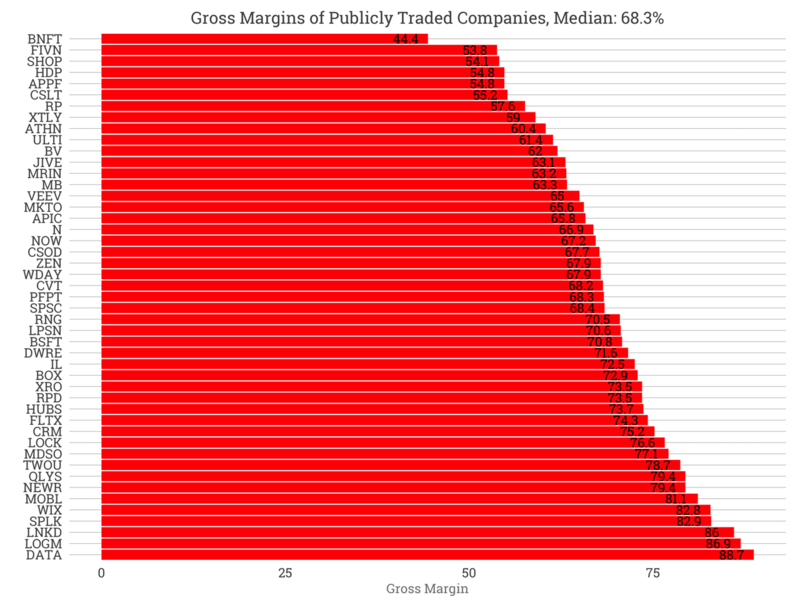 On the other end of the spectrum, Tableau, LogMeIn and LinkedIn record 86%+ gross margins. The median sits at 68.3% across all these companies over the past 12 months of earnings. What is gross profit? Below is the profit and loss, also called the net income statement, of a hypothetical SaaS company generating $10M annually. It’s a simple P&L, and some companies statements can be more complex. The business generated $10M in revenues in the past year. It spent $2M in Cost of Goods Sold. COGS include all the operational costs the business incurs to provide the service. This includes web hosting, software licensing fees for software embedded into the product like databases, and the customer success initiatives to on-board and retain customers. COGS also includes the salaries of the professional services (PS) team when customers pay for PS customization and training time. In a previous analysis, we saw the margin on PS varies widely by company. Certain companies resell other businesses products, which also contributes to COGS. For example, Five9 provides call center software and telephony software. Five9 buys telephone minutes from telephone companies and packages these minutes with their software so customers can make outbound calls through the Five9 software. The fees Five9 pays to telephone companies is a Cost of Goods Sold. Subtracting COGS from Revenue yields Gross Profit. Gross Profit divided by Revenue equals Gross Margin. Below Gross Profit, the Net Income Statement lists three categories of expenses: Sales & Marketing, Research & Development, and General & Administrative. The first two are expenses to generate new businesses and new products. The third includes the salaries of the CEO, back-office staff and other expenses. Subtracting these expenses from Gross Profit produces Net Income, and dividing Net Income by Revenue leaves us the Net Margin (%). A positive Net Margin means the company is profitable. That summarizes the Income Statement. But let’s get back to why Gross Profit matters so much. Basically, Gross Profit is the amount of money a business can invest in its growth. Let’s compare a business with 5% gross margin to one with 95% gross margin - an extreme example. If each sells $10M a year, the first can invest $0.5M in growth and the second $9.5M in growth. The second business has 19x the capital to invest in acquiring new customers and building new products. Using real examples, BenefitFocus must sell twice as many $50k contracts as Tableau to invest the same amount in Sales and Marketing. For two directly competitive companies, Gross Margin improvements translate into a competitive advantage. Gross margin can be an important strategic asset because better gross margins improve the capital efficiency of the business. The higher the gross margin, the more revenue can be reinvested in growth, the less money the business must raise to grow, the less dilution incurred. Not all revenue dollars are created equal, but all gross profit dollars are. That’s why gross profit is the gold standard to compare startups, not revenue.